Throughout the movie the audience follows the classic tale of the Grinch’s journey to destroy Christmas. However, Cindy Lou Who, played by Cameron Seely, has different plans. The old Cindy Lou woke up to get a glass of milk, to find the Grinch in her home. This year she is going to capture Santa Claus, little does she know she actually caught the Grinch. This only leads to many realizations from the Grinch throughout the storyline. The film has strong messages about family and making the best from what you have. However, the most important message shown is that if you are hurt, that does not mean you have the permission to hurt others. The Grinch never had a family of his own and felt left out at Christmas, so he tried to take that out on others. Along with the strong messages about the importance of family, Cindy Lou’s mother, played by Rashida Jones, is similar to a superhero figure, doing the most for her family by working and raising three kids all on her own. Because she does so much for her family, in return Cindy Lou wants to do something for her. Cumberbatch’s take on the Grinch is unique and rather funny. Throughout the movie it seems questionable that the Grinch’s heart is so small, because he is so good with animals, building strong bonds with the famous dog Max and a new character Fred, a reindeer. Pharrell Williams’ was featured as the narrator of the story, starting off as bland and unexciting but becoming more enthusiastic further into the film. 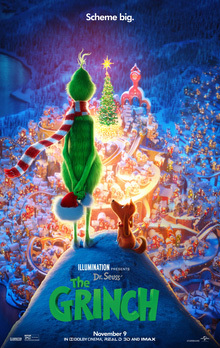 Music composed by Danny Elfman makes for a rather interesting Christmas playlist, ranging from classic Christmas music to new rap-styled remake specific to the movie, “You’re A Mean One, Mr. Grinch.” Tyler The Creator, who made the remake, also wrote a completely new song for the film, “I Am The Grinch.” The choice for him to work on the music was very odd of a children’s movie due to the fact that his other music is not very family-friendly. The 3-D animations through the entire movie were stunning. All together the movie brought wonderful holiday vibes, from the Christmas decorations to the snow covered trees. However, the famous exaggeration of Whos, citizens of Whoville, features was not present in the film at all. The faces of the towns people were more normalized and their hair was not in crazy styles. The end the film was enjoyable and great to take the family to. It will definitely be around for years to come.